A few days ago I had the best halloumi burger ever at bill’s so I decided to take on the challenge of recreating it at home which turned out to be a surprisingly easy and quick recipe. The two most important ingredients you will need are the halloumi burger slices and the sweet red pepper (ordinary red bell peppers don’t taste anywhere near as good). First up, fry the halloumi slices and red pepper in a little oil until the cheese is golden brown but be wary not to overcook is as it will turn tough and be too much on the chewy side. You can always roast the peppers if you want them to have more blackened skin, try and flatten the peppers with the back of a spoon as they are cooking so that they fit into the burger as a neat slice. Next mix a good dollop of the greek yoghurt with some sweet chilli sauce, next time I make these I’m going to use the hot version to make the burgers spicy. I add around two tablespoons of water to the dressing and give it a good mix to make it a better consistency to coat the salad leaves. Then just toss the dressing through some chopped up gem lettuce and it’s done. 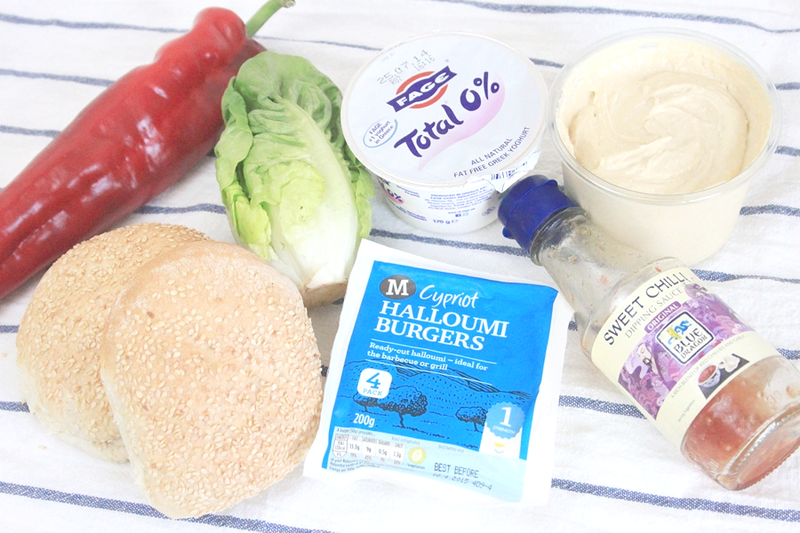 The final step is to layer up your burgers, start with spreading hummus on the base of the burger, then place on the red pepper, lettuce and finally the halloumi slice, you can always add extra of the yoghurt dressing on the top too. Bill’s use red pepper hummus in their burgers which adds great flavour, I’d recommend sticking with a sesame seed bun too as they taste so good with this burger.